Now through April 7, you can make your donation to the Hugo Good Neighbors Food Shelf go even further. For more than 30 years, Minnesota FoodShare, a program of the Greater Minneapolis Council of Churches (GMCC), has coordinated the March Campaign. The campaign brings together thousands of families, companies, faith communities, schools, and civic groups to raise a significant percentage of the annual food distributed by its recipient food shelves. 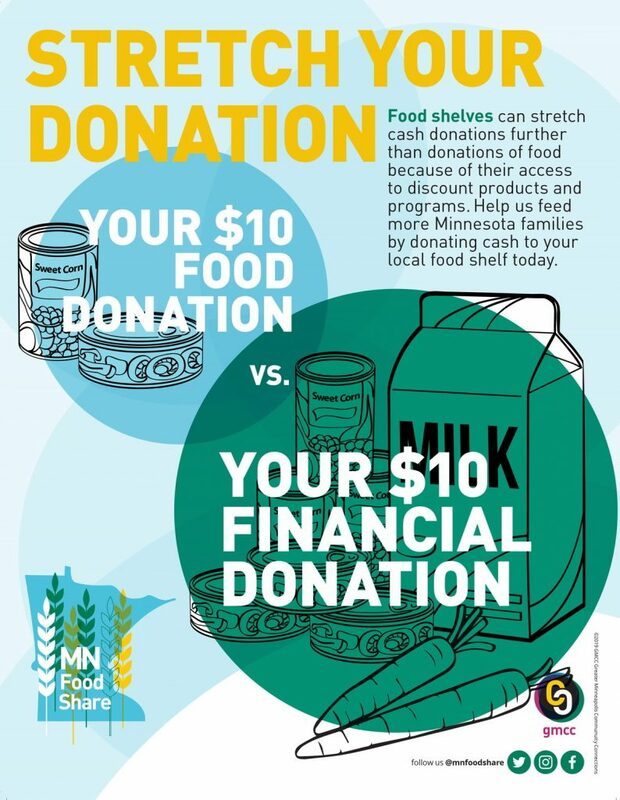 All of the donations received by Minnesota FoodShare are distributed to food shelves who participate in the March Campaign. As the need for food assistance in our community continues to grow, your help is needed now more than ever. Minnesota’s charitable food system (food shelves and food banks, meal programs, etc.) continues to run at capacity. Supporting government programs like SNAP (“food stamps”) and creating a more just and equitable food system are integral parts of meeting the needs of food insecure households and working toward ending hunger in our communities. U.S. Census Bureau, Decennial Census and American Community Survey.